There are a number of options when it comes to extending your Thai visa and this would depend on the type of visa you have in your passport. We will list the most common Thailand visa options and extension options. If you have any questions then ask us on the chat messenger or better yet walk into any of our offices in Thailand for assistance with your visa. This visa is valid for 90 days once you enter Thailand and can be extended to 1 year at Thai Immigration if you meet the requirements for the visa extension. We have listed the requirements here. This is a visa for those over the age of 50 and who meet the financial requirements as listed on this website. This extension is done at Thai immigration in Bangkok if the requirements are met and these requirements have been listed here. This is a 60 day visa and can be extend at Thai immigration in Bangkok or Thai Immigration in Pattaya or Phuket if you pay the 1,900 THB fee for an additional 30 days or another extension of another 7 days. This has been listed here. These can be extended. If it is a marriage visa it is explained here. If it is a business visa it is explained here. The Business visa can only be extended with a work permit. The tourist visa can be extend for an additional 30 days after the first 60 days have lapsed. This is explained here. If you need help with your visa application or extension then contact us on our main website for more assistance. We have offices in the following cities in Thailand. 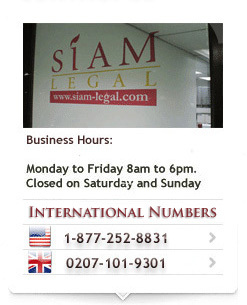 Contact any of our offices for assistance while in Thailand. See would main website where we will be able to assist you today. We have also listed the Thai immigration offices in the main tourist areas of Thailand and they are listed below. If you have any other questions then feel free to speak to a consultant on your chat messenger on the right of your screen. Speak to us today for a long or short stay in Thailand. I have a 30 days tourist visa. I want to extend or change it for a 60 or 90 days Non-Immigration visa (for volunteering) or type O. Im in Pai right now and my visa expires on December 22. Can I extend or change my visa without leaving Thailand? Can I just go in the Immigration office in Chiang Mai or even in Mae Hong Son? You have to change your visa into a non immigrant O visa at the Thai embassy in Vientiane. You cannot do it inside Thailand. I have entered Phuket (HKT) yesterday from Singapore ( 6.20 PM Tiger Airways). I have planned to stay at Phuket from 05.12.2016 to 20.12.2016 and moving to Pattaya from Phuket (UTAPAO PG282) on 20.12.2016, 15:10 PM. I have got an on arrival VISA at Phuket Airport from 5.12.2016 to 19.12.2016. I have already booked my flight from Phuket to Pattaya on 19.10.2016 itself and also the rooms are booked at Pattaya from 20.12.2016 to 27.12.2016. I need to extend my VISA from 19.12.2016 to 27.12.2016. Is it possible? Kindly help me with this. You need to contact the Thai immigration office in Phuket for the possible extension of your permit to stay. Hello, I am from Timor-leste/East-timor, and I just applied for tourist visa. I got 1 month visa which is going to be started from 20 December 2016 until 20 January 2017. I would like to ask, is it possible to make my tourist visa extension? if possible then for how long will I be permitted to stay? I am looking forward for your information. Yes, you may ask for the extension at the local immigration office for a fee of 1900 baht. I have a standard 30 day entry tourist visa for Thailand which runs out on 13th December. I left Thailand on 27th November but will re-enter on 12th December through the Cambodia/Thailand border. I fly from Bangkok on 14th December to England. Can I re enter on my current visa? And can I apply for an extension at the border crossing or at an office in Bangkok? How much would this be? Depending on your nationality, you will be given a new permit to stay stamp. It can be 15 days or it can be 30 days. It is free of charge. My question is can I apply for the 30 day extension on my single entry tourist visa 3 weeks into my 60 day stay? Or do I have to wait nearer the end of the 60 days? Can you also tell me how many days I would get at a border crossing via Cambodia if I re enter the country in February, I am a British citizen. You care able to extend your tourist visa as long as you are on the last 30 days of your current entry stamp. The fee is 1900 baht. As UK national, you get 30 days permit to stay when entering a land border.